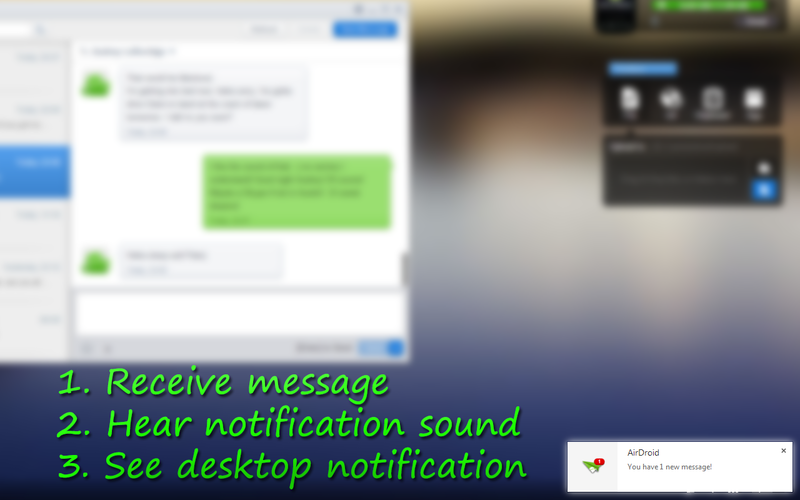 As a regular AirDroid user, I found that there is only thing keeping AirDroid from perfection: true message notifications. If you happen to be away from your phone (or have it on silent) and receive a message, the only notification you get is a small toast within the web interface; no sound, and no persistant notification. This means that I often have to be checking the Airdroid tab for new messages. After some researching, I could not find any simple solution for my problem; so I created my own. This is a simple, lightweight Google Chrome extension that will notify and ring you whenever you receive a new message! It uses webkit notification to ensure that you see it regardless of what window/tab you are using. Any incoming text message will trigger a notification that can be seen from any tab, any window, or any application. This extension is 100% free and simple to use! Just install it and get notified!